Most famine immigrants were unskilled laborers, and as such, had very limited sources of employment settling for whatever work they could obtain on any given day. Although they could earn up to a dollar a day9 for fifteen-hours of hard labor, because of the sporadic jobs available, they were hard-pressed to earn enough to maintain a family. Men and boys would have wandered the streets and wharves looking for the arrival of ships where they could find work unloading cargo, or perhaps a shop or mill that needed some assistance.10 There was stiff competition for jobs that were available with other Bostonians resulting in “No Irish Need Apply” signs being posted across the city. Everyone had to contribute to the support of the family and Irish single girls, if they were clean, may have had an easier time finding employment as maids in hotels or single households. The Health Department responded by attempting to clean the areas. 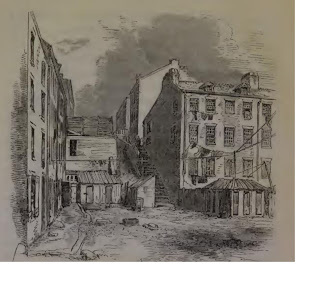 Notice was given to each residence requesting them to “thoroughly cleanse their houses, yards, privies, and drains, and deposit all decayed vegetable and animal matter, and other deleterious substances in the streets opposite their dwellings on certain specified days.”15 Each street was cleaned twice a week. Squads of police then inspected the area to ensure compliance with the regulations. That was the environment our Brown family found when they arrived in Boston in January, 1949.
third piece of information was found in the 1849 Boston City Directory. This record shows “Mrs. Hannah Brown” residing at 4 Humphrey Place.19 Humphrey Place in is the Fort Hill area of Boston. Additionally, Ellen was numerated in the 1850 U.S. Census Mortality Schedule. 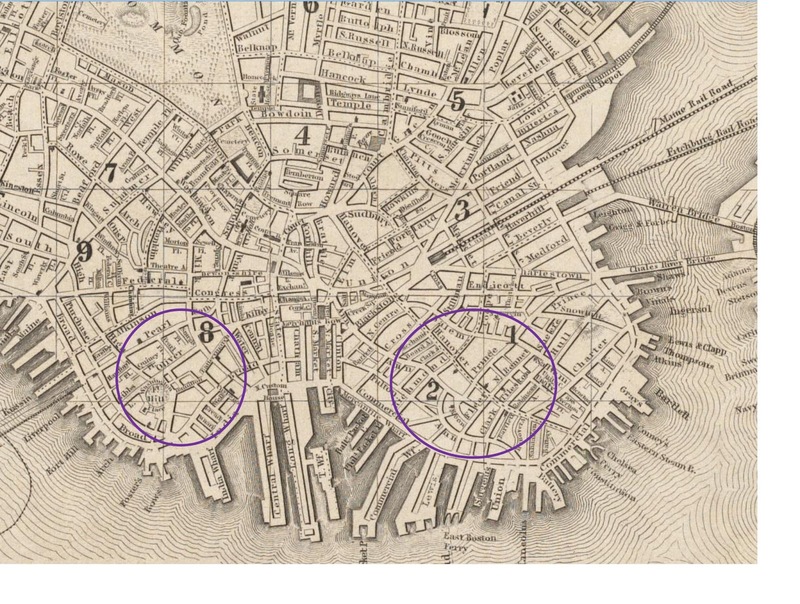 Below are two maps showing more detail of the area where the Brown family lived. 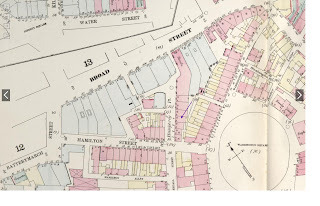 The first map is a Sanborn Fire map from 1867.20 Although this is sometime after the Brown family left Boston, the footprint of the buildings match a map from 1852, around the time of their residence. I have chosen to use the Sanborn map because it gives more detail. The purple arrow is pointing to the house at 4 Humphrey Place. Zoom in on the map to see the house numbers given in front of the buildings. The yellow buildings behind Humphrey Place are frame structures, probably those thrown up to house additional refugees. An “S” within a structure indicates there was a “store” in the lower level. Large circles at street intersections show where hydrants were located. 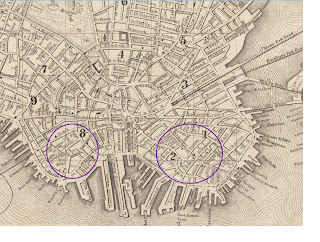 The second map shows an 1880 street map of Boston superimposed over a map of the Shawmut Peninsula.21 I have chosen to include this map because it does show, topographically, the area around the Brown residence. 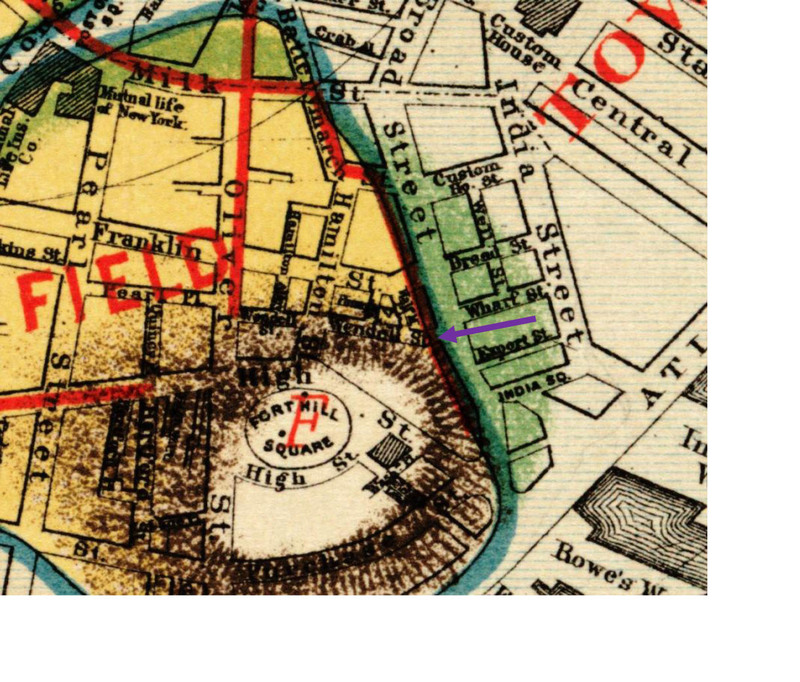 Again, look at the purple arrow pointing to Wendell Street (Humphrey Place was renamed Wendell Street22) and notice the slope of the ground where they lived. Their building would have backed into Fort Hill. The blue line was the original water line; green would have indicated low lying or swampy areas. I do not know if the Browns lived on Humphrey Place the entire time they were in Boston; I only know they were living there at the time of Ellen’s death. Since this population was very transient, they may have lived somewhere else, or many other places, during their stay. Like many other Irish families, they certainly must have questioned the wisdom of leaving Ireland. For some, incredible as it seems, it would have been an improvement. For others, it was worse and those are probably the ones who left the coastal towns for other opportunities. And so, it was with our Brown family. I don’t know if the entire family moved as one unit, or, if one or both older boys went ahead, but our Brown family next traveled to Vermont, and, that will be our next stop on this journey. 9. The History Place op.cit. Table XIII shows a “Distribution of Occupations by Nativity, Boston, 1850.” Domestic servants and laborers are by far the largest occupations for the Irish immigrant. Of the 3,249 domestic servants in Boston, 2,292 were Irish. Likewise, Irish laborers made of 7,007 of the 8,552 laborers in the city. The next most common occupation for the Irish was that of a tailor. There were 1,045 Irish tailors out of the 1,547 in the city. Of the 43,567 employed in the city, 14,595 were Irish. The three occupations described above made up 10,344. 13. Ibid. p.14, p167-169. Half-moon Place is situated in the rear of Broad street, and is formed by a kind of excavation into the side of Fort Hill . . .” The only entrances to the block were from Broad Street, an archway from Burgess’ alley, and a “battered staircase, ‘Jacob’s Ladder,’ which led to the comparative heaven of Humphrey Place” about 50 feet above. 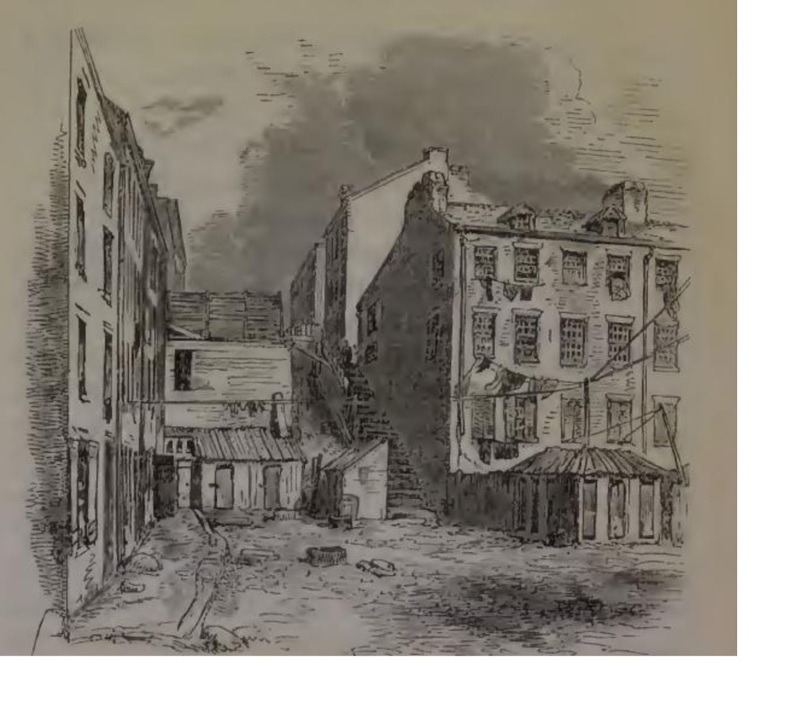 Image of Half-moon Place is from the Report of the Cholera in Boston. 16. I was discussing the discovery of Ellen’s baptism with Marion. She did some quick searches and located the death record for Ellen on Ancestry. This discovery put the family firmly in Boston at this time. 19. 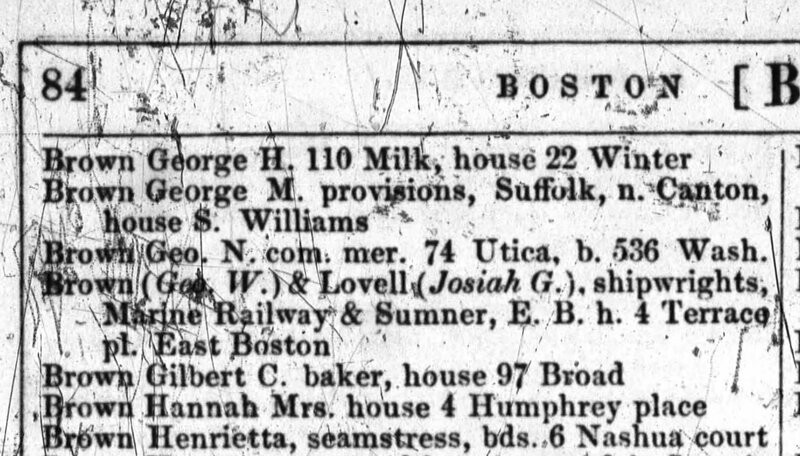 Fold3.com, The Boston Directory: The City Records General Directory of the Citizens, July 1849 to July 1850, [database on-line], Fold3 by Ancestry. No entry was found for Hannah in 1848 or 1850. No entry was found for Timothy in 1848 – 1850. 22. A Record of the Streets, Alleys, Places, Etc. in the City of Boston, City of Boston Printing Department, 1910. 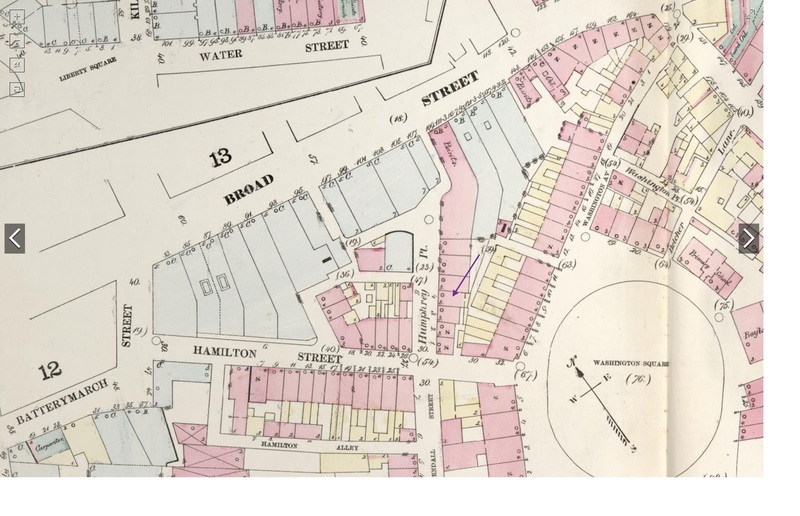 Humphrey Place was laid out in 1825 and ran from Hamilton Street east. It was later extended to Broad Street and included part of Half-moon place. The name was changed to Wendell Street in 1870. Mary Ann, I am enjoying the blog do very much. Not knowing much about doing research myself, I wonder how you go about finding all the references you use to document your story. Well done! Yes it is. I need to do some experimenting. I just do not have the expertise at present to do intelligent google searches or find information like you have been able to find. But seeing what you have done is helping me learn.Now the key for me is to practice.